Troyon’s fellow townsman and pupil, Van Marcke, has attained high rank in the line of his master’s successes. He is, indeed, a master of brushwork and vivacious effect.… He groups and models with excellence, usually making marked contrast of color, as a white cow against a black one. Émile van Marcke de Lummen was born in Sèvres to a family of artists on August 20, 1827. Sèvres was one of the foremost established porcelain centers in France and much of his family, including himself, was employed there as designers. His grandfather was Charles van Marcke, a Belgian artist who settled in Brussels and specialized in porcelain painting. His father was Jean-Baptiste, the eldest son of Charles, also a painter, who specialized not only in porcelain painting, but also in landscape and animal painting. His mother, Julie Palmyre Robert was the daughter of the director of the factory, and was also an accomplished still life artist. Thus, from a very early age Émile was surrounded by artists and artisans and immersed in a culture and way of life that was centered around the Sèvres factory. Around 1832 his family returned to Liège, Belgium – his father was originally from there – where Émile enrolled in a local academy to study drawing. His family later moved back to Sèvres where Emile began his career as porcelain painter at the porcelain factory, working from 1853 to 1862. Here he became acquainted with the famous animalier Constant Troyon who was also employed at the factory. Tryon urged Emile to paint from nature while introducing him to painting in the vein of the Barbizon school. The influence of his father and Constant Troyon were the driving forces behind Émile’s choice of imagery. He had learned to appreciate the landscape unique to France and also began to introduce animals into his compositions. Several animaliers, those who focused on the depiction of animals, had surfaced, such as Troyon and the Bonheur family. These artists displayed farm animals in a realistic fashion influenced by the increasing interest in naturalistic execution. 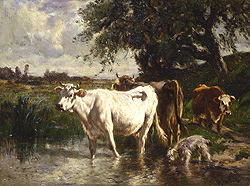 Émile, much like the Bonheurs, focused primarily on depicting cows and later began studies of animals at the Imperial Farms in Villeneuve-l’Étang and Grignon. Just as he was influenced by his painter father, he would also instill a love for nature in his daughter and son, Marie van Marcke de Lummen (later married and named Marie Diéterle – 1856-1935) and Jean van Marcke de Lummen (1875-1918). Moving from porcelain painting to studying animals was a transition that could only have taken place under the influence of Troyon, but it proved to be a significant move for Emile since he used his experience at the farms for his debut at the Salon. 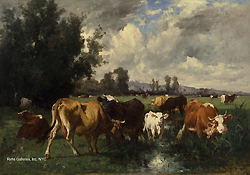 In 1857 Émile exhibited two works, L’Arrosage au Purin, Prairies Normandes, and Vue Prise dans la Ferme Impériale de Villeneuve-l’Étang (View of the Imperial Farm at Villeneuve-l’Étang). He traveled throughout the country in search of subject matter but favored the landscape and cattle of the Normandy region, especially that of the Bresle valley – which would become the inspiration for many of his works. He eventually bought a farmhouse in Boutencourt, in the Bresle valley, where he set up his studio. Similar to most successful artists of the period he also kept a studio in Paris where he lived and worked during the winter months. Throughout his lifetime Émile’s works were highly sought after and collectors in the United States purchased a great deal of his art. In February of 1870, through the art agent George Lucas, John Taylor Johnston, who was the President of the New Jersey Central Railroad and the first President of the Metropolitan Museum of Art, visited van Marcke in his Paris studio and acquired his Salon painting of that year for 8 000ff. 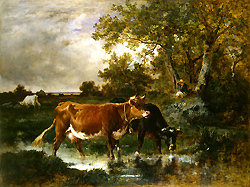 In 1872 William T. Walters, through Lucas, acquired van Marcke’s Troupeau de Vaches Passant un Gué (Herd of Cows Crossing a Ford) for 12,000ff. In July of 1876, Samuel P. Avery commissioned a large oil from the artist for 8000ff which was to be started after the Salon of 1877; in March of that year Avery ordered an additional 3 works. In June of 1879 William H. Vanderbilt authorized Lucas to purchase van Marcke’s Salon painting for 25,000ff; later that year Vanderbilt acquired another, smaller work, for 10,000ff. Emile also became a famous figure in England when he began exhibiting his works there in 1878. In M. Émile van Marcke de [L]ummen, France has lost one of the most distinguished of her animal painters. Born at Sèvres in 1827, he was a pupil of Troyon, to whom, as to Corot, he owed a conspicuous debt. He was an indefatigable worker, and since 1857 the Salon has never been without a specimen of his skill. He received the customary honours and decorations. He was awarded medals in 1867, 1869 and 1870, and was appointed Chevalier of the Legion of Honour in 1872. At the Universal Exhibition of 1878 he received a medal of the first class. 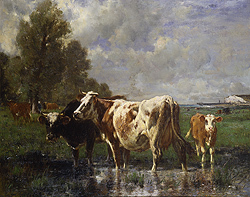 Emile van Marcke de Lummen became an established artist based on imagery that had been gaining in popularity from the time of the 1848 revolution; the idyllic image of the French countryside and a realistic depiction of animals. His popularity spread beyond the borders of France to England and America, further popularizing these images of rural France and earning him an international reputation as an animalier and landscape painter in the tradition of the Barbizon painters of earlier decades. Today his works are house in many public and private collections and three wonderful examples – The Approach of a Storm (Troupeau de Vaches Passant un Gué), Early Morning, and The Pool - can be seen in the collection of the Walters Art Gallery, Baltimore, MD.